NorthStar Storage delivered a mobile storage unit to my home a few months ago. The NorthStar moving guys helped me load my stuff into this portable storage unit (which took them about 15 minutes!!! ), and they drove the storage unit to the NorthStar warehouse in Chatsworth. of course I asked for the help of the professional movers (which again, loaded everything I had in the mobile storage unit into my garage in less than 15 minuets this time). The whole experience was incredibly convenient, and unbelievably inexpensive. This is not the first time I am using storage in Los Angeles. In the past, I rented a self storage room, rented a truck, and spent half a day moving things into my storage room, and another half day moving things out of storage when it was time to get things back to my new place. This time, when searching for a storage place on the internet, I found some companies which would deliver a portable storage unit to my home. I thought this is a great idea: I wouldn’t have to spend my time renting a truck, load my things into it and out of it into the storage room, and do the whole thing again when it’s time to move things out of storage. 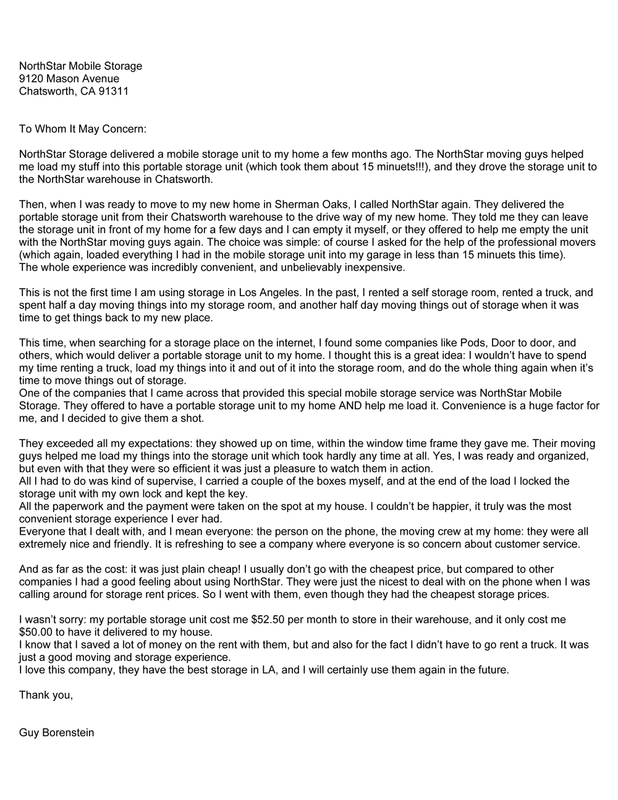 One of the companies that I came across that provided this special mobile storage service was NorthStar Mobile Storage. They offered to have a portable storage unit to my home AND help me load it. Convenience is a huge factor for me, and I decided to give them a shot. They exceeded all my expectations: they showed up on time, within the window time frame they gave me. Their moving guys helped me load my things into the storage unit which took hardly any time at all. Yes, I was ready and organized, but even with that they were so efficient it was just a pleasure to watch them in action. All I had to do was kind of supervise, I carried a couple of the boxes myself, and at the end of the load I locked the storage unit with my own lock and kept the key. All the paperwork and the payment were taken on the spot at my house. I couldn’t be happier, it truly was the most convenient storage experience I ever had. so concern about customer service. I wasn’t sorry: my portable storage unit cost me $52.50 per month to store in their warehouse, and it only cost me $50.00 to have it delivered to my house. I know that I saved a lot of money on the rent with them, but and also for the fact I didn’t have to go rent a truck. It was just a good moving and storage experience. I love this company, they have the best storage in LA, and I will certainly use them again in the future.